Asian products have never been more sought after than today. In an interview with CMO.com, Martin commented on how Asian brands are doing in comparison with their Western counterparts. Today, the Asian branding landscape is experiencing a strategic transformation. A great number of external factors are causing local markets to open up to global brands at amazing speeds. In the recent past, brands who have met with success are facing arrogance and complacency. If this does not change, these brands will slowly but surely see a decline in brand leadership. 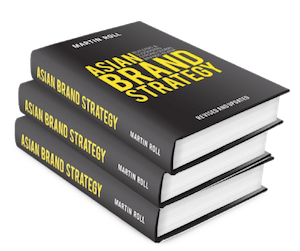 Thus it is imperative that Asian boardrooms realize the strategic value of branding. Branding is critical for Asian brands who are looking to successfully reach out to consumers. The Asian business landscape is transforming very quickly. Instead of cutting prices on homogenous products and seeing branding as advertising, Asian brands need to create product differentiation through branding and realize that this can bring higher returns. They need to also understand that branding effects not one, but all aspects of the business. It is also not uncommon for Asian business owners to delegate branding to mid- or low-level executives. To become truly brand-driven, organizations need to view branding more strategically and with a longer horizon. The topic of Korean tech giant Kakao hiring a 34-year-old CEO also ignited a discussion about leadership transition in Asian organizations and how it impacts the changing landscape. Hence the CEO needs to be involved throughout the brand journey. Charles & Keith: Founded in 1996 as a footwear store, Singaporean brothers Charles and Keith Wong realized the potential for creating trendy and designer-inspired shoes in the region. Today, Charles & Keith is well-known across Asia as a fashion brand that provides consumers with the latest fashion – from shoes to bags to accessories. The TWG Tea Company: Founded by Moroccan-born Taha Bouqdib in in Singapore in 2008, the brand completely redefines tea-drinking and offers luxury tea products ranging from signature tea blends to tea accessories and tea perfumes. The 1837 date on its logo marks the time when Singapore became a trading post for teas, spices, and fine epicurean products. This interview appeared on CMO.com in January 2016.